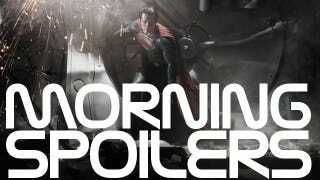 Zack Snyder reveals why they changed Superman's iconic costume for Man of Steel! The new Superman director also explains Christopher Nolan's role in creation of this new Superman reboot, and how Henry Cavill might fit into Justice League. Meanwhile, who will be the Justice League's Batman? There's some new speculation. Plus your first glimpse of footage from the movie of Joe Hill's Horns, and set photos of a huge action scene from Tom Cruise's All You Need Is Kill! "The costume was a big deal for me, and we played around for a long time. I tried like crazy to keep the red briefs on him. Everyone else said, ‘You can't have the briefs on him.' I looked at probably 1,500 versions of the costumes with the briefs on. If you look at the costume, it's very modern, but the relationship to the original costume is strong. You come onto a project like this, and you hear about modernization and you hear about bringing things forward to today, and all you can do is hope that it's going to look cool and different from anything you've seen before." "We approach the film as a single endeavor. There are a lot of gears that have to turn in the world of commerce and the world of the mythology we create to facilitate more adventures for this character. We'll see what happens... I don't know how ‘Justice League' is going to be handled. Honestly, I don't. But ‘The Man of Steel' exists, and Superman is in it. I don't know how you'd move forward without acknowledging that." "We tried to approach this as though there's never been a Superman movie before, but at the same time respecting the canon and mythology. There are the pillars that you have to respect, and I'm not about to break them. But it is fun for me to bend them and mess with them. There's a logic and concreteness that has to exist with Chris. You can't just do stuff because it's cool. He demands that there be story and character behind all of it, which I'm a big fan of." "I'm having a ball. It's great working with young people. [Chris Hemsworth is] a wonderful actor and a great new star. I haven't been in the film that much. I've been in isolated scenes with Chris." London's famous Trafalgar Square was shut down for the filming of Tom Cruise and The Bourne Identity director Doug Liman's future war movie, in which Cruise plays a soldier who keeps reliving the last battle of his life. The scenes show Cruise arriving by helicopter in full uniform. Here are a few photos from the set showing Cruise's double, courtesy of WENN.com, and you can check out a bunch of photos of Cruise himself over here. Here's a promo and a sneak peek for this Sunday's midseason finale, "Made to Suffer." Here's a promo for the eighth episode of the season, "Til Death." Here's a promo for tonight's fall finale, "Nobody's Fault But Mine." Next week will be the first time that all the Mathesons are in the same city since the premiere. So there are lots of opportunities to see what could happen there. A big challenge for Miles is - [as] part of him revealed in the hallucination he had last [Monday] - if Monroe asked him to come back, he would like that. We are going to see Miles and Monroe come face-to-face, and Monroe is going to ask him to come back to the militia... Monroe really means it when he says, "I want you back. Come back." We'll see that next week. Of course, that's a crisis for Miles. A lot of that's going to be revealed in [Monday's] episode…. It's really the heart of the episode. I can tell you we really go pretty deeply into how the bond was formed, how far back in their lives it goes and the crisis that that presents in the present for them both when they come face-to-face. And there is an epic sword fight. I have to say that. It's fantastic. Here's a promo for this week's winter finale, "Queen of Hearts." "There are certain things that I do as young Regina. I change my voice and give her a higher voice. There's an (upcoming) episode where she's transitioning and she's just about to become the Evil Queen. So I chose certain lines to drop to a deeper resonance in my chest. I sometimes jump in the air when I am playing young Regina and I try to get a very light feeling. "When I play the Evil Queen so much of it is guttural. I studied voice for 10 years so there's a series of voice exercises I like to do that help ground me when I am about to play the Evil Queen. "You're going to see a very different Regina. She is actually becoming more sane. And she's becoming more reasonable and more human, really. She's really trying to do the right thing and I love that about her. She's very vulnerable. I think it's a start. It's an incentive getting Henry back for her. I do think it's a real redemption. Any kind of effort towards self-improvement and being a better person, trying to do the right things and taking responsibility is a step in the right direction. "It's not like he's just some kid. He's her child. And that's how I've always seen it. Her blood's not pumping in his veins but that doesn't really make any difference. Changing his diapers since he was a baby, it is her son - so I think if her redemption is to get Henry back, that's just the first step. She has to confront everything she's ever done. And that is where the true redemption is in my opinion. She has to really do a lot of soul searching and really looking at herself in the mirror and go ‘Who am I, what have I done?' He (Henry) is the incentive, but you'll see throughout the second season as she moves forward, she really does take responsibility for what she's done and that is the true redemption." You'll see a snippet of her past. Everything ties in very nicely this season, I'll say that. What are you excited for the fans to see this season? I can't give away a lot, but it gets stranger and darker. People are going to think we're a cable show with how dark it gets. The dream [that Henry and Aurora share] is hugely important to the rest of the season. We discover that we can use to our benefit – but then, whatever can be used for good can also be used for evil. That's a big theme in the next two episodes. What was once good can be used for evil, and vice versa. It's really important to keep that in mind over the next two weeks. Here's a sneak peek at the next episode, "Hunteri Heroici." Here's a promo for this Thursday's episode, "My Brother's Keeper." The gang spend a long night at a wild house party where they are stalked by a mysterious killer rabbit. While tracking it down, Rudy meets the enigmatic Nadine and finds himself head over heels for the first time in his life. By the time the night has drawn to a close, Alex has finally revealed to Jess the secret he has been trying to hide - but will their relationship survive his shock revelation? Here's a sneak peek for this Thursday's episode, "Out Of Control."